Tourism in Scotland is very much centred around the city of Edinburgh, where tourist attractions are certainly plentiful. To gain something of an insight into the history and heritage of the city, consider either joining a guided walking tour or bus tour, or spend some time at the rather touristy Edinburgh Experience. The Royal Observatory is another enticing attraction of note, while tourists in Edinburgh will also find a good selection of performances at the Festival, Kings, Royal Luceum, Bedlan and the Assembly Rooms theatres. Forming part of the Holyrood Park, the Arthur's Seat Volcano provides a stunning easterly backdrop, overlooking the Dunsapie Loch. 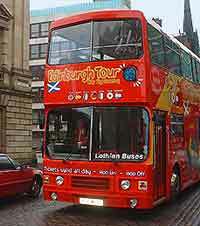 Open-top hop on / off guided bus tours operate throughout the day at regular intervals in central Edinburgh. These bus tours provide an easy way of sightseeing in the city and with daily hop on / off tickets, they are also a very useful way to travel around , since you can leave the bus to explore and get back on when you are ready. The bus tours connect all of the major points of interest, including numerous tourist attractions, landmarks and local monuments, being operated by several different companies, including the local regional transport offices. These buses that depart every 15 minutes from Waverley Bridge, close to the city's main train station. Robert the Bruce's Foot Soldiers is a top place of interest within this area and is housed in Edinburgh Castle. This impressive display of soldiers also features an interesting exhibition, which explains what it was like to be a soldier in Edinburgh 700 years ago. The Edinburgh Experience is one of the most popular tourist attractions and can be found in the heart of the city centre. Housed in the Observatory, which was built in almost 200 years ago, the Edinburgh Experience features a short, 3D film, which explains the history of the city and how it evolved to be the capital city of Scotland. A convenient car park is available nearby. The Royal Observatory moved from Calton Hill to its present position in 1896, when light pollution became too strong. Offering spectacular views across the city and the surrounding area, the Royal Observatory is to be found in the Bruntsfield area of the city. Although there are telescope sessions every Friday evening, weather permitting, the Royal Observatory is not classed as a working observatory. Instead, it has evolved to become an important Scottish telescope research centre. The extensive visitor centre at the Royal Observatory is excellent and basic astronomy is clearly explained, together with the interesting history of Scottish astronomy, including a number of interactive displays and games. A theatre has stood on this site since 1830, and since this time has undergone many changes and transformations. The current Edinburgh Festival Theatre was opened to the public in 1994 and the impressive glass-fronted Festival Theatre is one of the most visited entertainment venues around. With regular theatrical performances, drama, opera and cabaret, other attractions at the Festival Theatre include many prestigious concerts which are held throughout the year, particularly during seasonal festivals. Situated in the Old Town area of Edinburgh, the Kings Theatre works closely with the Festival Theatre and has many attractions for tourists holidaying within the city, including almost 1,400 seats, regular theatrical performances and numerous famous performers. 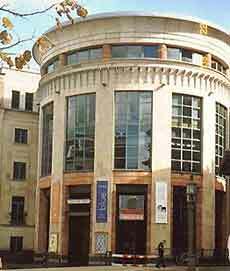 The Traverse Theatre is well-known in the city for encouraging up-and-coming writers and many interesting and unusual plays are performed here each year. Situated in the city centre, highlights for tourists and visitors to the Traverse Theatre include regular comedies, dramas, dances and the atmospheric Traverse Bar Café. The Royal Lyceum Theatre is located in the city centre, off the busy Lothian Road. Attractions at this theatre include numerous theatrical dramas throughout the year, four theatre bars, and a small restaurant. 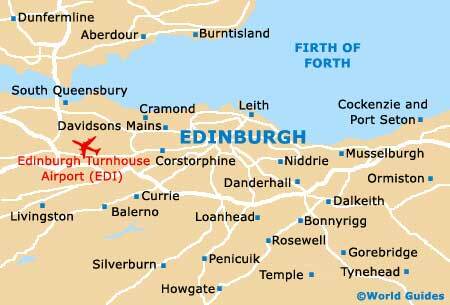 The Edinburgh Theatre Workshop can be found in the New Town area of the city and offers something a little different. This music and drama venues has a number of other attractions, including a café, a bar area, and there are also regular exhibitions at the Edinburgh Theatre Workshop. The Assembly Rooms Theatre can be found in the New Town area and is operated by the City of Edinburgh Council. Attractions at this theatre include a large music hall, impressive architecture, an 18th-century ballroom, stunning drawing rooms, a large chandelier and ornate ceilings. The Assembly Rooms Theatre plays an important part in the Fringe Festival and features many well-known stand-up comedians and touring theatrical groups. The Bedlam Theatre, opposite Greyfriars Kirk in the Old Town area, is actually a converted church and is full of character. This theatre is particular popular with tourists visiting Edinburgh during the Edinburgh Fringe Festival, when there are numerous comedies and shows for children at the theatre. Situated in the heart of central Edinburgh, this impressive ice-skating rink is created every year for a few weeks in the middle of winter, when it becomes the largest open-air ice-skating rink in the United Kingdom. Other attractions at the Winter Wonderland ice-skating rink for visitors include many small lights, stalls selling hot food and drink, professional displays of ice-skating curling matches, ice-hockey matches and an exciting, friendly atmosphere. The Edinburgh Crystal Visitor Centre was founded in 1867 and can be found on the outskirts of the city, in the Penicuik area of Edinburgh. Over the years, the Crystal Visitor Centre always enjoys high visitor numbers and comes with guided tours, glass-blowing displays, a factory shop, a crystal glass shop and a café area. 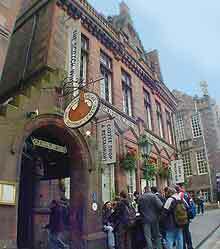 Edinburgh's Scotch Whisky Heritage Centre is situated in the Old Town area and is a fascinating place to visit. With regular guided tours in different languages, the distillation process of this important Scottish whisky is explained. Other highlights for visitors at the Scotch Whisky Heritage Centre include a barrel ride for children, displays and exhibits about whisky making over 300 years, a bar, a bistro and there is also a popular gift shop. The large Shaping A Nation Complex is the ideal place for some serious retail therapy and is part of impressive Fountainpark complex. Located to the west of Edinburgh's city centre, attractions at the Shaping A Nation Complex include a multiscreen cinema, tenpin bowling alleys, restaurants, exhibitions and a motion simulator ride. Arthur's Seat is Edinburgh's famous extinct volcano and this is one of the most breathtaking natural tourist attractions in the whole of Scottland. This impressive volcano has been inactive for more than 300 years. 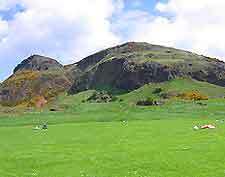 Highlights at Arthur's Seat Volcano include spectacular panoramic views across the city, East Lothian and Fife. The New Town Conservation Centre is the centre for the city's administrative committee, which funds conservation work in the historic New Town area of Edinburgh. With an interesting exhibition, the glorious architecture in the New Town has earned this area the prestigious accolade of World Heritage Site. The Salisbury Centre, situated on the south side of the city centre, where it is successfully managed by the local Edinburgh community. Founded in 1973, the Salisbury Centre has a number of attractions, including classes in meditation, Yoga, Tai Chi and a number of alternative therapy classes taught by experienced teachers. In the Calton area of Edinburgh, Our Dynamic Earth is an ultra-modern structure, with a gleaming, tent-like entrance hall. Highlights at Our Dynamic Earth include simulated earth tremors, displays depicting different zones of the world and virtual helicopter rides. Located on the outskirts of the city, the Edinburgh Canal Centre is particularly apealing to those with a love of the great outdoors, staying in this area of the city. These main activities include regular scenic cruises, sightseeing trips, a dry dock area, a impressive reception centre, restaurants and a gift shop.